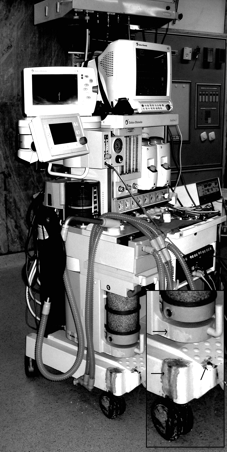 Corrosion in Datex Ohmeda Aestiva®/5 Anesthesia Delivery System: Is it time to modify the design? We have been using the Aestiva ®/5 anesthesia delivery system [Datex Ohmeda, USA] for providing general anesthesia to patients in our institution for some years. Recently we have come across an intriguing problem with the usage of the circle absorber on this system. 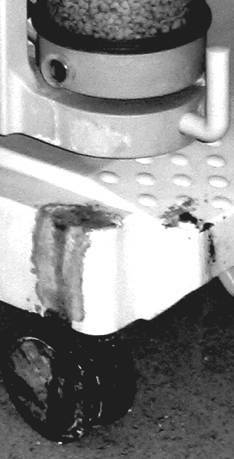 Prolonged usage of this system has led to the gradual corrosion of the area of the machine immediately below the base of the soda lime canister accompanied by white deposits around it, despite regular maintenance (see figure), the aesthetic consequences and nuisance value of which are easy to imagine. Soda lime (4% sodium hydroxide, 1% potassium hydroxide, 14-19% water and enough calcium hydroxide to make 100%) neutralizes the carbon dioxide accumulated in the closed circuit with the formation of an insoluble carbonate and regeneration of the alkali base as given in the reaction below 1. This mixture of the insoluble carbonate and the strong alkali base along with water might trickle down from the canister placed on the Aestiva® / 5 delivery system and seems to be the main causative agent for the corrosion of the metal parts thus seen. Carbon dioxide absorbents can degrade sevoflurane to Compound A, which is nephrotoxic in rats and is the subject of intense debate regarding possible nephrotoxicity in humans. In addition, dry absorbents can degrade desflurane, enflurane and isoflurane to carbon monoxide the levels of which may rise dangerously high during prolonged usage of these agents in the circle system. Recently new absorbents such as the AmsorbTM (Armstrong Medical, Coleraine, Northern Ireland), MedisorbTM (Datex-Ohmeda, Bromma, Sweden), and the Drägersorb 800 PlusTM (Dra¨ger, Luebeck, Germany) which possess decreased amounts of strong bases like KOH/NaOH have been created to help deal with the problems of modern volatile anesthetic agent breakdown. MedisorbTM, marketed by Datex Ohmeda contains 1-2% NaOH, 0.003% KOH and 70-80% Ca (OH) 2. It has been found to reduce to a significant degree, the production of Compound A when used with sevoflurane; a property which has been linked to the decreased amounts of strong alkali bases in its chemical composition as compared to standard preparations of soda lime 2, 3. It is pertinent to mention in this regard that considering the financial constraints imposed by the cost of these agents (1-2 US$/Kg) 3 and the lack of free availability worldwide, we have been using standard soda lime preparations strictly conforming to the Indian Pharmacopoeia specifications in terms of carbon dioxide absorption, granule hardness, and porosity etc. with the circle absorbers on the Aestiva ®/5 anesthesia delivery system in our institution. Using these agents, we have not encountered any problem with the safe and efficient removal of carbon dioxide from the circle system and provision of normocapnia to our patients. We would like to know the experiences of our colleagues with the use of these newer absorbents on the Aestiva ®/5 anesthesia delivery system and whether the corrosion on the equipment that we are encountering with the use of standard soda lime preparations is anything more than just a simple flaw in design. That being the case we suggest certain design modification such as the provision of an optimally placed drainage system below the soda lime canister, which can be removed for cleaning purposes. Secondly we would like to know whether it is advisable to use only the absorbent recommended by Datex Ohmeda i.e. MedisorbTM.If that is so, then necessary instructions may be issued along with the system. We strongly recommend the manufacturers [Datex Ohmeda, USA] to look into this problem at the earliest so that it can be remedied in future versions of this system.